Invite the Scripture Lady to present her preschool Bible song program “Let’s Sing Some Psalms” – a fun Scripture-filled musical presentation for young hearts. For some Christians, the Psalms have been the most important part of the Bible. They convey such deep and rich truths about God. But as profound as all the Psalms are, they can also be a blessing to even the youngest heart of a preschooler. In addition to sharing the fun acrostic, the Scripture Lady introduces young David to your preschoolers. She shares how he began writing and singing songs to the Lord at a very young age and even got to sing to King Saul in his palace. He learned to praise God at a very young age. Teaching Point #1: We can PRAISE God! – Psalm 150:6 says this: “Let everything that has breath praise the Lord!” Your little ones are very much alive and should be learning that they can praise God by telling Him that they love Him. Bible Verse Song #1: “Breathe In, Breathe Out” (Psalm 150:6) – This extra fun Bible verse song is a great way to share the truth of Psalm 150:6 that if you have breath, you should be praising God. Teaching Point #2: God made us SPECIAL! – God has made each one of us very special. We are not perfect, but God loved us so much that He made each of us in His own image. That is very special! Bible Verse Song #2: “Fearfully and Wonderfully Made” (Psalm 139:14) – Psalm 139:14 says this: “I am fearfully and wonderfully made. I know that full well.” The word “fearfully” used in this verse means that God took great care in making each of His children. It’s very important that we teach our preschoolers that God made each of them with great love and wonder! Bible Game #1: “Which Instrument did David Play?” – Here’s a fun and musical game that your children will enjoy. The Scripture Lady plays the sounds of different instruments that young David in the Bible might have played. The children have to guess which instrument goes with the correct sound. Teaching Point #3: God is ALWAYS loving! – One of the greatest needs of our little ones is security. Therefore, the sooner they learn that God will always love them, the better! Teaching Point #4: God’s Word is a LAMP and LIGHT! – Preschoolers are often afraid of the dark. What a great age to share that they don’t have to be afraid, because God will wrap them up in the wonderful light of His Word, the Bible. Bible Verse Song #4: “Lamp and Light” (Psalm 119:105 and Proverbs 6:23) – This is one of the children’s favorites as they watch the Scripture Lady don a lampshade on top of her head to sing how God’s Word is a lamp unto our feet and a light unto our path. Teaching Point #5: MEDITATE or think about God’s Word, the Bible! – Meditate is a big word, but it really just means to think about something with great focus. Preschoolers aren’t really ready to focus too much, but they are ready to learn that the Bible is important and that it is good to think about it. Bible Story Song/Game: Scripture Lady’s Bible Story Book – For this game, Kathy uses one of her favorite props, “The Bible Story Book.” Inside are pictures of fun Bible characters such as Noah, Moses, Abraham and David. Kathy sings a little song and the children have to guess who the Bible person is. 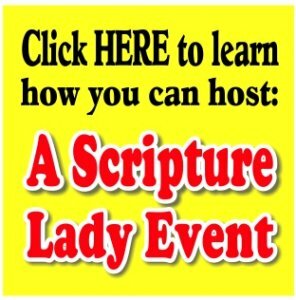 Bible Game #3: Scripture Lady’s Who, What, When, Where, Why and How Puppet House – Scripture Lady’s puppet house is always a huge hit! After singing about some Bible people in the last song, the Scripture Lady brings out Scamper the Squirrel to quiz the children about the Bible stories. Teaching Point #6: God makes our hearts STRONG! – The program is almost over and Kathy invites all the children to stand up and stretch. The word “stretch” begins with the letter “S” and stretching makes us strong. But it is God who makes our hearts strong! Bible Verse Song #5: “Heart Free” (Psalm 119:28, 32) – This great Bible verse says this: “Strengthen me according to your Word. I run in the path of Your commands for You have set my heart free.” What a great truth to learn that knowing God’s Word will make our hearts strong to serve our loving God.